If you’re reading this, you’ve found my blog at just the right time–when I’ve written nothing on it, and all the good stuff is yet to come. It’s part of a completely new layout for LocalVisibilitySystem.com. 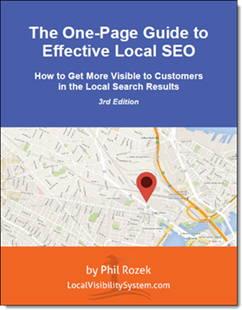 As before, my mission is to provide info that helps you get your business visible to local customers in Google Places. I realize my blog area is kind of bare for the immediate time being, but you can still get some great info right now by downloading my free 7-step guide to local visibility. That alone should be enough to get you more visible to customers. Other than that, I’d love it if you’d contact me with whatever questions you have. I’m going to get an RSS feed up here ASAP, but in the meantime, do check back from time to time, if you have a business that you’d like to get visible.